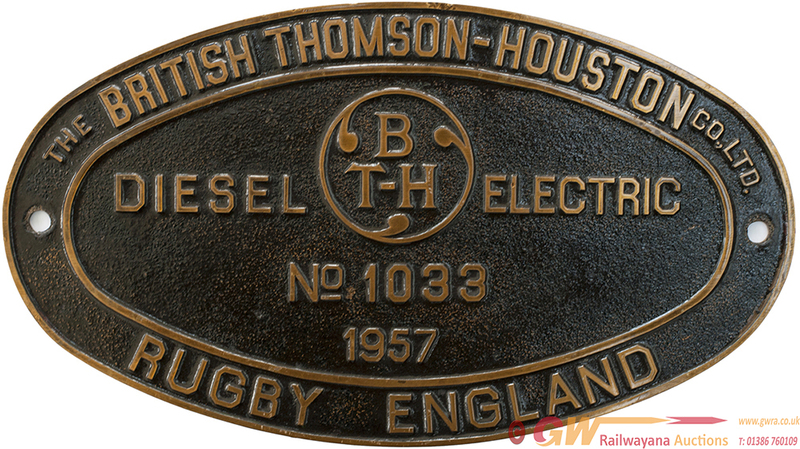 Diesel/electric worksplate oval cast brass THE BRITISH THOMPSON-HOUSTON CO LTD DIESEL ELECTRIC NO 1033 1957 RUGBY ENGLAND EX BR CLASS 15 D8202. Initially allocated to DEVONS ROAD BOW in 1958 and withdrawn from STRATFORD June 1968. Cut up at Cohens Kettering in 1969. Front lacquered over original paint, rear ex loco.